This rare perfume set is called " Le Collier d'Isabey " and came out in 1925. 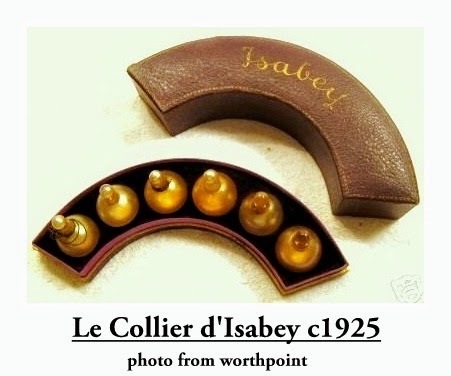 Isabey won a gold medal in 1925 , when it introduced "Le Collier d'Isabey" (the Isabey Necklace) at the Paris Exhibition. It is also known as "Le Collier Parfume" (the perfumed necklace). The presentation consisted of six pearl shaped perfume bottles arranged to simulate a pearl necklace in a demi-lune presentation case. Andre Jolivet used his "laitance de hareng" pearlization technique for the bottles. 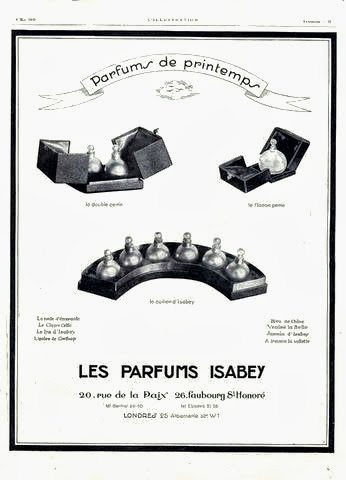 Isabey also made usage of these small round bottles for their individual perfumes such as Ambre de Carthage, Chypre Celtique, Bleu de Chine, Violette, Gardenia and Chypre. Photo from worthpoint.